God, it was perfect. What a perfect poem to recite on this day. What a perfect selection for a perfect day. What a fitting end – or beginning. God, it was perfect. And the wind blew on the 15 of us gathered at Union Cemetery to place Dad’s ashes with Mom’s. The wind we had felt before. It had been with us all our lives. The wind gave us comfort as the temperature soared above 35 degrees. The wind was cooling and healing. We all remembered the glint of a diamond snow. And God knows we remember Dad’s favorite song, “Snowbird” by Anne Murray. The snow had been with us – well other than the Dancing Nannies – all our lives. The snow gave us joy and comfort when we played in it as kids. The snow was something from which we could escape into our snug homes when it became too much. Sunlit ripened grain. What an image. What powerful words. And then the wind tossed our hair again. Grain. This was an image that both Mom and Dad would have shared from their separate childhoods – Mom from the prairies and Dad from New Lowell. Grain would be ground into flour and used to nourish the body and soul. When you awake in the morning’s hush I am the swift, uplifting rush of quiet birds in circled flight. Dad was there with us. We all saw the birds. On this day, when we gave Dad to be with Mom, the birds were chirping and gliding, and playing in the air above us. On this day, when we gave Dad to be with Mom, the sun shone on our faces and warmed our souls. None of us thought of Mom and Dad as gone, on this day. We knew they were there. We all shed tears – together. We all closed our eyes in prayer, together. 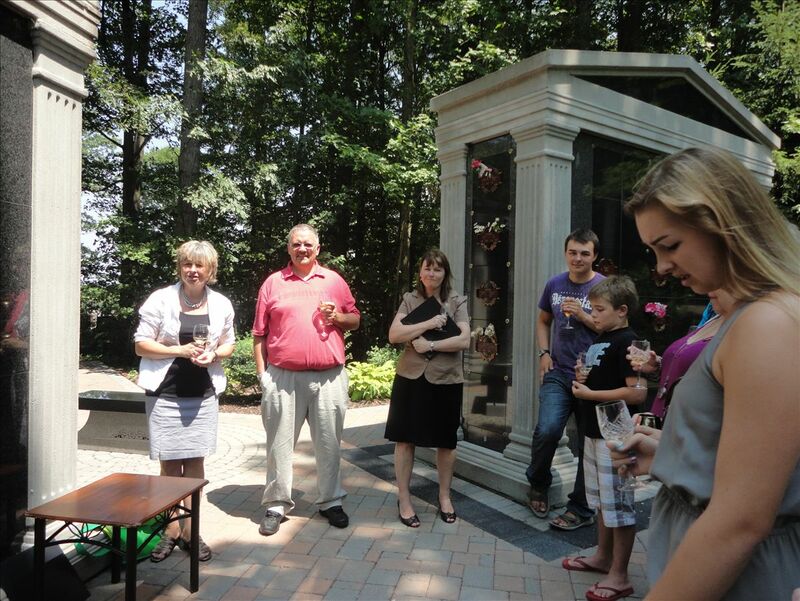 We all gathered to pay our respects to Mom and Dad – together. And we all felt the wind blow gently on us – together. Who has seen the wind, several of our new family members queried. And the answer was a resounding, “Neither you nor I. But when the trees bow down their heads, we know its passing by.” The wind was there. Mom and Dad were there – and finally – together. You brought a tear to my eye this morning. Thanks for sharing this with us. I hope that was a good thing…thank-you. And you are always welcome. Thank-you. Straight from the heart.